This Katana belongs to Jojo ranking. Blade length : 76.0 cm or 29.92 inches. Width at the hamachi : 3.4cm or 1.34 inches. Kasane : 0.74 cm or 0.29 inches. Era : Later Edo period. 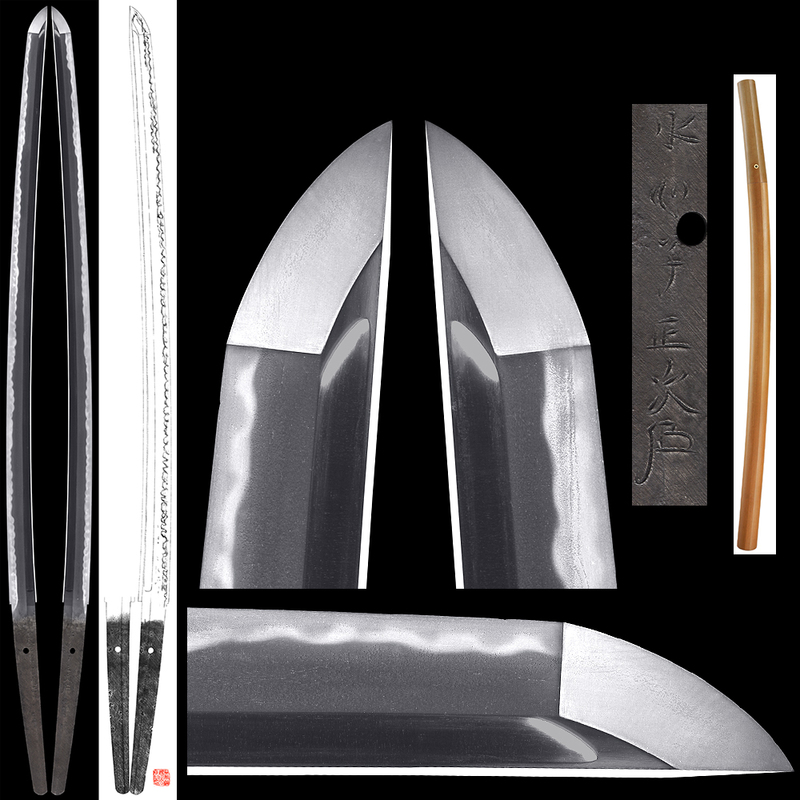 Shape : Width of the blade is 3.4cm at Hamachi. Wide, thick and long blade with Bohi engraved on both sides. Jitetsu : Koitame-hada well grained with Jinie attached. Beautiful Jigane. Hamon : Nie-deki Gonome-midare with Nijyuba mixing. Ashi working well with a lot of Saryu and Kinsuji working in Jinchu. Boshi is Midarekomi style turning round shape. Special feature : Suishinshi Masatsugu is a student of Naotane and also a student of Suishinshi Masahide. as a sword smith in Edo through out his life. His signature is very similar to Suishinshi Masatsugu. of Banei 1st Year but it is observed that he was helping his mentor, Naotane with sword forging. He studied from Suishinshi Masahide and also Naotane both the great masters. This sword looks Naotane Soshu den style with active hamon with sunagashi and Kinsuji. We can see Masatsugu’s wonderful technique effected by great masters Suishinshi Masahide and Naotane from this blade. From Aoi Art:At a glance, the blade looks Naotane style. The blade is healthy and wonderful jigane and Hamon Sosyuden style. JPY 1,900,000- → JPY 1,750,000-. (shipping costs not included in price) Price reduced! 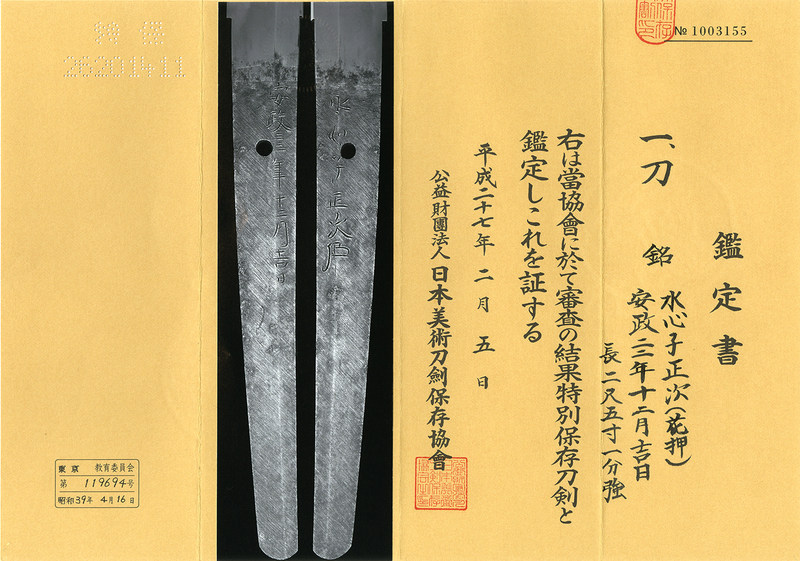 Katana:Mumei(unsidned) attributed as Echizen Rai.